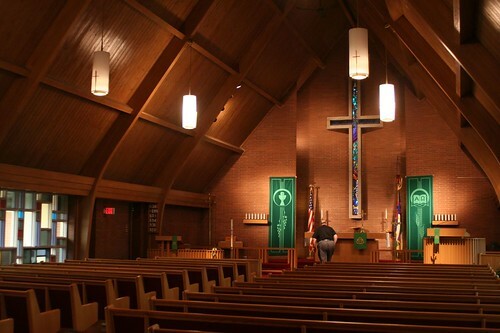 He’s most famous for his magnificent chapel at Valpairaso University, south of Chicago. 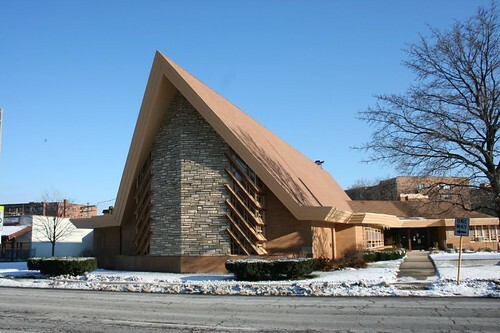 But Park Ridge architect Charles Stade designed dozens (reportedly hundreds) of churches, across Chicagoland and across America, from the early 1950s until his retirement in 1981. 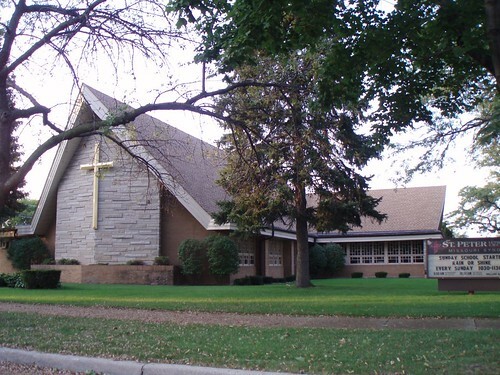 He worked with many denominations, but his own Lutheran faith gave him the largest number of commissions. 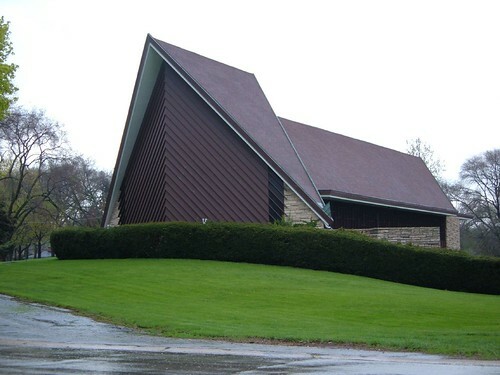 It’s not hard to spot a Stade church: just look for the big A-frame building with a random checkerboard of colored glass squares, with gill-like stacks of sloping wood mullions. 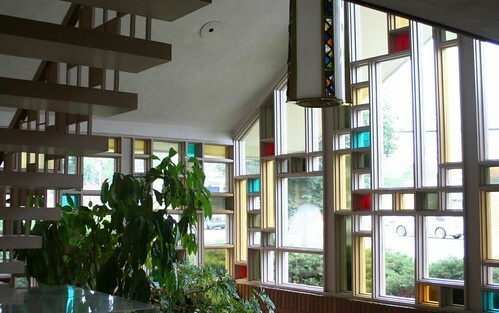 It’s a style that was heavily influenced by the angular styles of Frank Lloyd Wright, particularly his Unitarian Meetinghouse in Madison, WI. 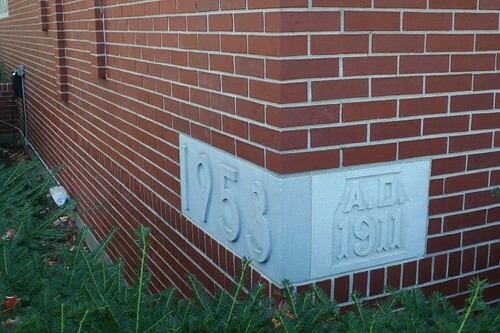 Ashlar-cut gray stone end walls are also pretty diagnostic of Stade’s stock style. Stade was a consumate Modernst. 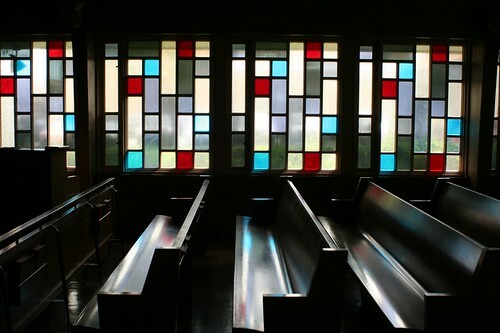 He designed simple, elegant, geometric buildings, largely bereft of ornament, that relied on the magic of light and space to bring them to life. 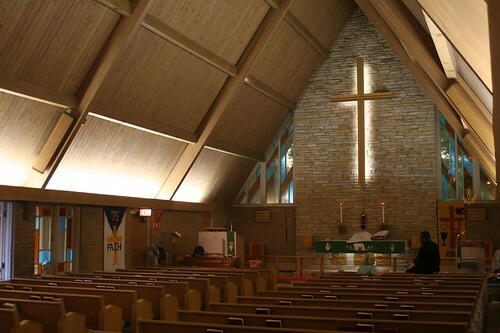 Also in keeping with the Modernist ethos, he was not at all ashamed to recycle ideas for building designs, to the extent that many of his smaller churches are totally interchangeable. And yet, none of them are clones. Each is uniquely designed. 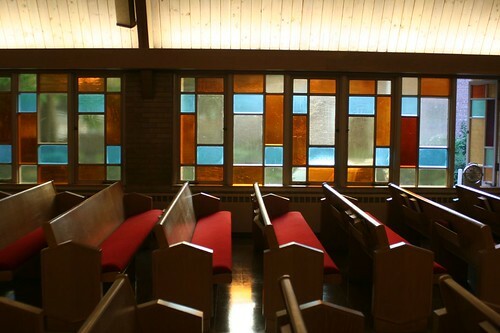 Each contains an original floor plan, each has unique glass patterns, each has custom-designed liturgical furnishings. Stade loved his angles. Some of the most hypnotic moments in his designs are where angles repeat and pile on one another. 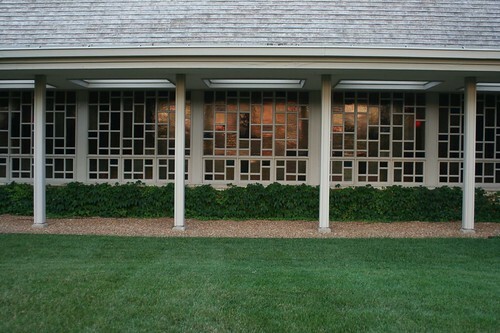 And he loved his grids. 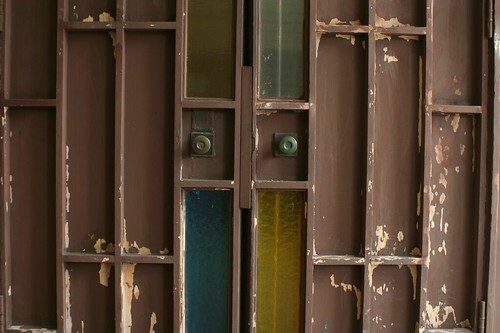 Nearly every Stade church has a wall that’s a grid of randomly sized openings in different colors. 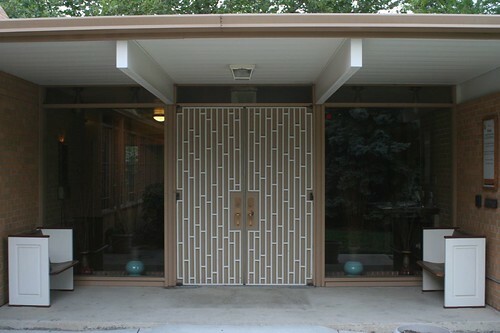 Stade even designed doors in this style, sometimes setting the handles in a deeply recessed grid of thin wood elements. There’s definitely something memorable about reaching your hand into that grid to grasp and pull the handle. 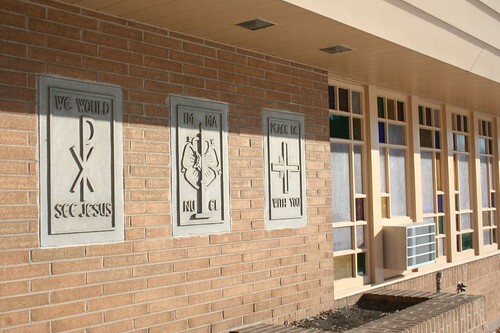 A fourth Stade element is simple concrete sculpture plaques, displaying symbols of the church along with short quotations. And a final Stade signature is the cornerstone – usually rendered in limestone, with a simple, raised sans-serif font announcing the year of construction and nothing else. 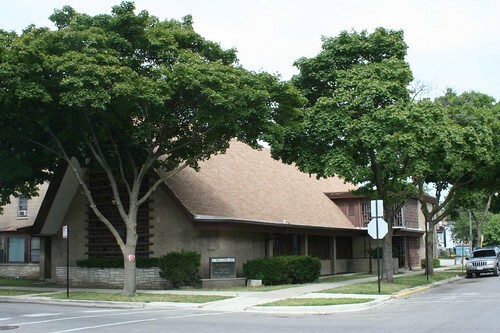 One can see him settling into his trademark style with the 1953 St. Andrew’s Lutheran Church, an early work up on Northwest Highway which already contains several of the signature elements. 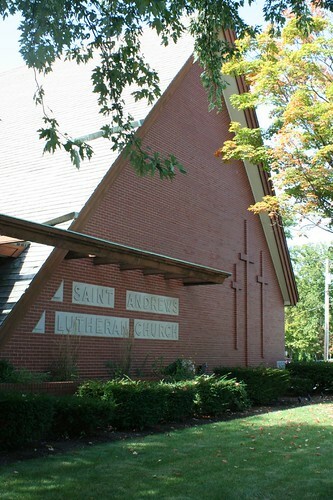 St. Andrews has red brick, a solid end wall, and boxed-out stained glass windows with faceted glass, all of which mark it as unique from the stock style that Stade would be mass-producing in by 1958. 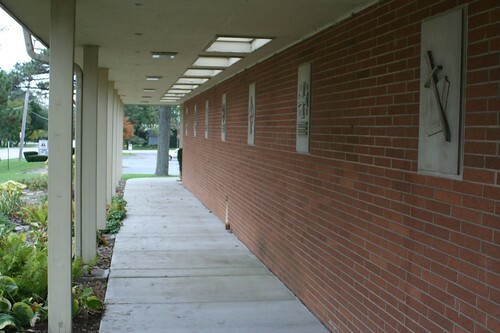 Stade was one of the second-generation Modernists, bringing contemporary design to the masses, making good, serviceable buildings that were affordable, handsome, clean and elegant – ideal for the suburban frontier. His work was not necessarily scrutinized by the glossy high-end magazines, but it was certainly worthy of it. 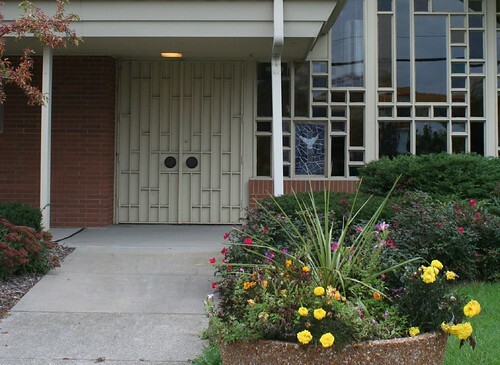 This entry was posted in Charles E Stade, Midcentury churches. Bookmark the permalink. Fantastic!! Thanks for sharing all this – it's like hitting the jackpot. Really nice work man. I'm not as well informed as the others, but thank you for sharing. Good stuff! Hi, thanks for these great posts. 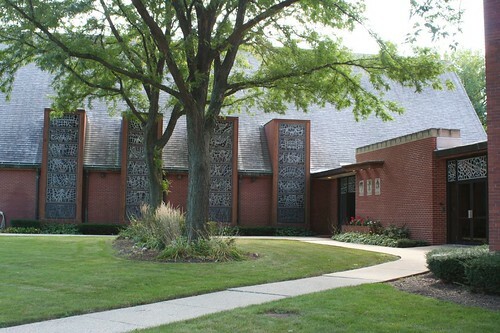 I'm working on a book that includes a section on Stade and would love to communicate directly with the person who wrote the post, BW Des Plaines. Are you also working on Wm. Cooley? 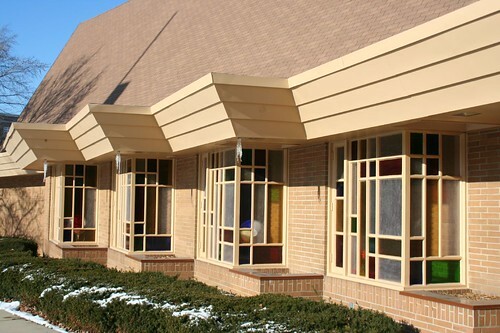 Please contact me at Gretchen.Buggeln@valpo.edu. 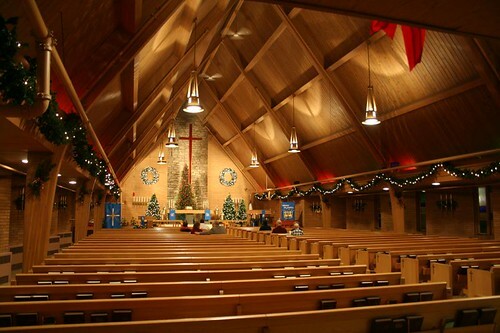 Stade worked closely with two liturgical artists whose work is evident in these churches. 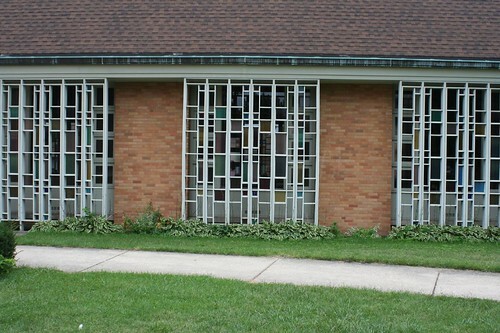 Ernst Schwidder, who for a time was on the art faculty of Valparaiso University, carved much of the decorative woodwork. 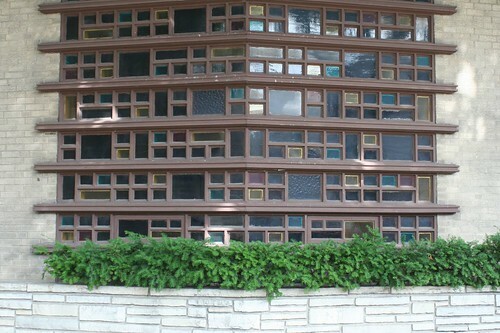 Reinhold Marxhausen, of Concordia College, Seward, Nebraska, designed many of the square stone panels on Stade's church exteriors. 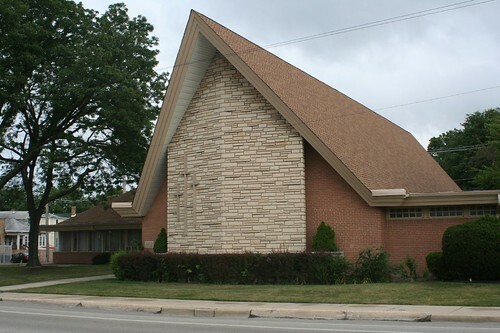 Thanks BW DesPlaines for your listing of Charles E. Stade's work, but your forgot ONE: Zion Lutheran Church in Kewanee, IL. My godfather was on the building committee and worked directly with Mr. Stade. Oh, I'm sure there are many more. 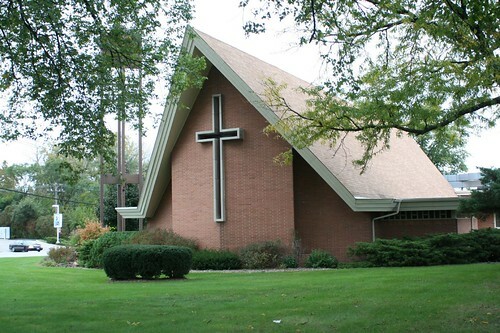 BW Des Plaines said Charles Stade's brother was pastor at Immanuel Lutheran in Des Plaines, That is not correct. The family were members there and the brother was a pastor, but he was a missionary to Nigeria. 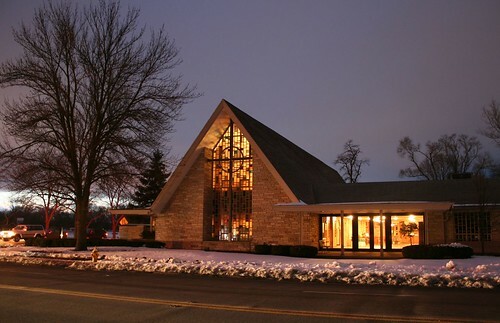 Charles' father, Christ, constructed the church in Des Plaines.An Immanuel member. 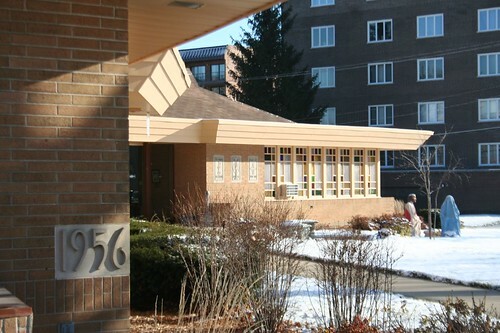 We have just realized that our home designed in early 1951 was by Charles E. Stade. 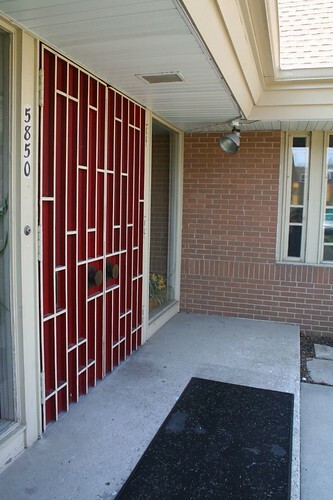 I would like to find information on other private residences that he would have done in the early 50s. If you can hlep with any sources, please post here or email me at irispr51@comcast.net. Thank you. Thanks for this. 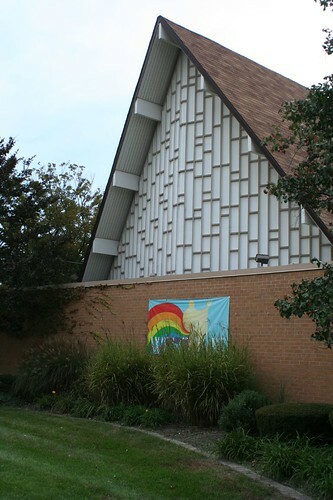 You have an old picture of our church, Hillside Free Methodist Church in Evanston, IL. 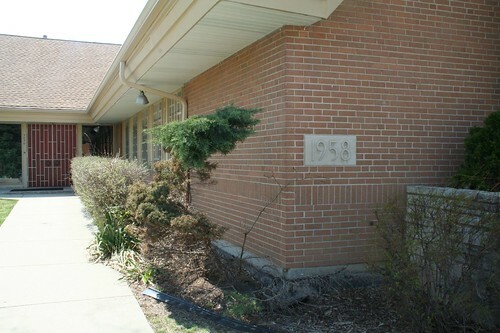 Check out our website (www.hillsidefree.com) or our facebook page and you will see an updated photo of the exterior with a cross in the front like so many of the others, and better landscaping. 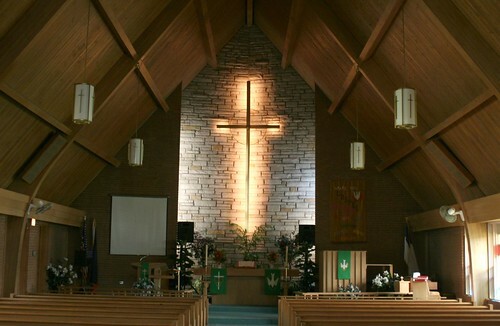 I still have the original blueprints from when the church broke ground in late 1959. 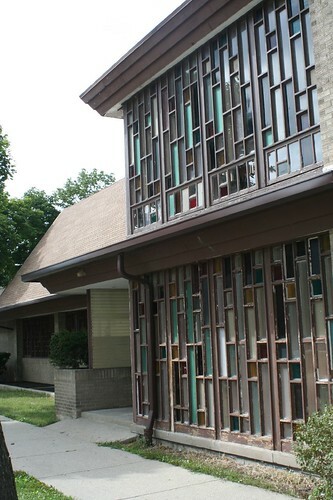 We had our first worship service in the building on Palm Sunday 1961. 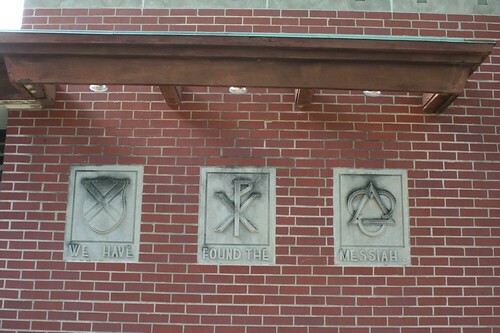 We still get many compliments about the building, especially because of the wood and stonework used. It would cost a fortune today to use those materials.